Amritsar Sahib (KP) - In response to the ongoing barrage of anti-Sikh propaganda being spread by the controversial Spokesman tabloid, several Panthic organizations gave a stern warning to it's ex-communicated editor and it's supporters to immediately cease and desist such future activities or face serious consequences. 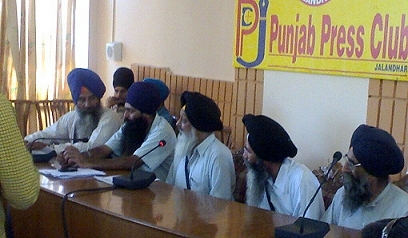 In a joint press conference organized by the Akhand Kirtani Jatha, GURSIKH Organization, and the Shahbaaz Khalsa, key representatives of all three organization reiterated that on March 10th of 2004, the editor of the Rozana Spokesman newspaper was ex-communicated from the Khalsa Panth, and a boycott was ordered on his profane publication that had been continually attacking the Sikh Rahit Maryada, Sikh History and the Authority of Sri Akal Takht Sahib. "(the) ex-communicated editor and it's supporters (should) immediately cease and desist such future activities or face serious consequences..."
Members of the Akhand Kirtani Jatha 11 member executive committee, including Bhai Mohkam Singh Ludhiana, Bhai Parnam Singh, Bhai Mohinder Singh Kala Sanghian, and Bhai Joga Singh along with Bhai Sukhmander Singh Faridkot, Bhai Sehajgit Singh Amritsar, Bhai Jaswinder Singh Kapurthala, and Amandeep Singh Kapurthala from GURSIKH and Shahbaaz Khalsa were all present at the news conference. The organizations stated that they would work with Nihang Dals, the Sant Samaj, Student Federations, pro-Panthic Akali Dals, and dozens of other Sikh organizations to expose the so-called Sikh leaders and politicians who supported and patronized this anti-Panthic tabloid. Bhai Mohkam Singh and Bhai Parnam Singh Ji stated that they have kept tabs on organizations and individuals who have provided financial and moral support to the Spokesman paper after its editor was ex-communicated. They declared that the names of those violators would be forwarded to Sri Akal Takht Sahib so action could be taken against them at a Panthic level. The leaders affirmed that if attacks from such venues did not stop, Panthic organizations, under the aegis of Sri Akal Takht Sahib, would then resort to launching a Panthic movement akin to the one launched in the 1970s against the pseudo-Nirankai heretics. The representatives indicated that for public awareness, a white-paper is being published by Panthic scholars very soon on renegades from Sri Akal Takht Sahib who have been spreading poison against Sri Dasam Patshah's Bani. They revealed that Akhand Kirtani Jatha units from California, Toronto, Germany, France, Sweden, UK, and many other countries are working together with the 11 member executive committee on these initiatives. In a separate interview with PW staff, Akhand Kirtani Jatha representatives from Delhi, Punjab, and Toronto vehemently denied mis-information being printed in the Rozana Spokesman that the Jatha was sympathetic towards Ragi Darshan Singh's views on Dasam Granth and that it had taken action against certain members who were opposed to the controversial Ragi. "Akhand Kirtani Jatha firmly stands with the Panth on the issue of Sri Dasam Granth. We strongly condemn those who discredit and disparage the Sacred Bani of our Tenth Guru Sahib. The Jatha will always abide by Sri Akal Takht Sahib's edicts and Panthic norms. Those who go against them in the name of the Jatha have nothing to do with us", stated one Jatha spokesperson. The three organizations have been working together for many years on various Panthic initiatives, including the case against Gurbakash Kala-Afghana at Sri Akal Takht Sahib, the DSGMC Bhani Murti debacle and the Sri Guru Granth Sahib Beadbi case.